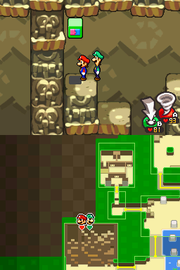 Puzzle Sacks are four special items found in Mario & Luigi: Bowser's Inside Story. Each one holds a piece of Kuzzle's furniture, broken up into puzzle pieces. 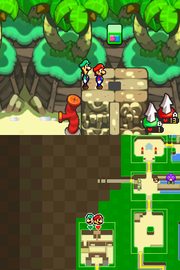 After Mario and Luigi complete Kuzzle's initial puzzle and receive the Spin Pipe attack, Kuzzle tells them about the Puzzle Sacks and where they can be found. If Mario and Luigi find the sacks, return them to Kuzzle, and put the puzzle pieces together, they receive one of every type of bean for each of the first three completed puzzle, plus 10 of every type of bean (5 of every type of bean in the remake) after completing the fourth. 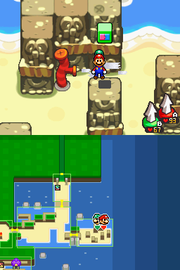 In Mario & Luigi: Bowser's Inside Story + Bowser Jr.'s Journey, Puzzle Sacks are now visible on the map after completing the Spin Pipe puzzle. The player should head east from the mountainous area back to the main part of the beach. 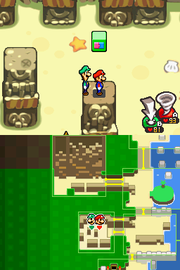 Then, the player should travel south and west to reach a pillar-filled area. The player should Spin Jump from pillar to pillar to obtain the final Puzzle Sack. The player should head south out of the spiky floor area and east back to the main part of the beach. From there, the player should go south and then west toward the mountainous area. The third Puzzle Sack rests at the top of the mountain, so the player will need to jump and Spin Jump their way to the top. The player should walk back to Kuzzle's house, then head south, south again, west, and north to the area with the spiky floor. The player should drill under the two gates and use the air pipe to attain the Puzzle Sack above the ledge. Alternatively they can use the shell to break the decayed tooth in the west to reach the air vent. From Kuzzle's house, the player should head north towards the Sea Pipe Statue. The player should continue to the eastern edge of the beach. The player should use the air pipe to reach the Puzzle Sack atop the high ledge. This page was last edited on April 6, 2019, at 07:01.